Let me tell you what I think of bicycling. I think it has done more to emancipate women than anything else in the world. It gives women a feeling of freedom and self-reliance. I stand and rejoice every time I see a woman ride by on a wheel … the picture of free, untrammeled womanhood. Ever since my first bicycle as a kid, I have loved riding a bicycle. This Susan B. Anthony quote really rings true for me. I feel that freedom when I am moving on two wheels. International Women's Day was March 8, and I never realized how the bicycle was one of the symbols in the women's movement of late 19th century. Bicycles came to symbolize the quintessential “New Woman” of the late 19th century. The “new woman” was the feminist ideal during the Progressive Era, a time of great social and cultural change for women. The image of the new woman reflected many of the new opportunities for careers and education that were opening up for them. The “New Woman” was deemed to be young, college educated, active in sports, interested in pursuing a career, and looking for a marriage based on equality. She was also almost always depicted on a bike! This bicycle linocut is based on a photo I took of an old bike I had when I was living in California. The linocut is 3 inches height by 4 inches width on a 5 x 7 120 weight printmaking paper. What do you like doing that gives you a sense of freedom? I adore your bike! It is so typical of what I think of when I think "bicycle"! To me freedom as a woman is being able to have the money to live your own life, even if you choose to share it with someone else! QuiltSwissy, I so agree and my Mom felt the same way. A woman's ability to secure her own financial independence goes hand in hand with freedom. And I don't believe anyone has to get married to enjoy that freedom. 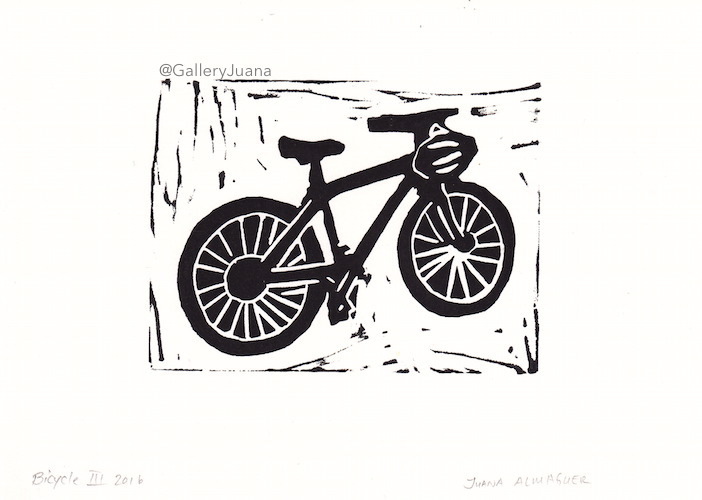 Beautiful job on the linocut and a worthy tribute post to the bicycle! What a wonderful bicycle and it was interesting to learn about the role they've played. It's great to look at your lovely bicycle and reading the remarkable text. I'm really grateful for both, the invention of the bicyle as well as the emancipation! Many thanks for sharing the noteworthy thoughts and illustration! Wonderful linocut and I had never thought about the freedom that comes with these wheels. Thanks for sharing. I love black and white lino cuts. After reading your thoughts on women and bicycles, I would highly recommend a movie to you called "Wadjda." An excellent film about a Saudi girl whose dream it is to own a bicycle. Such a great linocut! I love the fine details. I did my only linocuts years ago at school and I still remember cutting deeply into my left index finger at the time so my respect for anyone doing linocuts is huge. I'm too afraid of trying it again. I don't agree on the bicycle being the best thing that has happend to women with regard to emancipation (that credit for me will forever go to the washing machine) but me too I love to ride my bicycle and it sure is a great invention. For some reason, I could not get the capcha on your blog to recognize my input. I kept getting an error. Thank you everyone for your visits and comments and sharing your memories around the bicycle theme. Sonja, the washing machine was definitely a game changer!